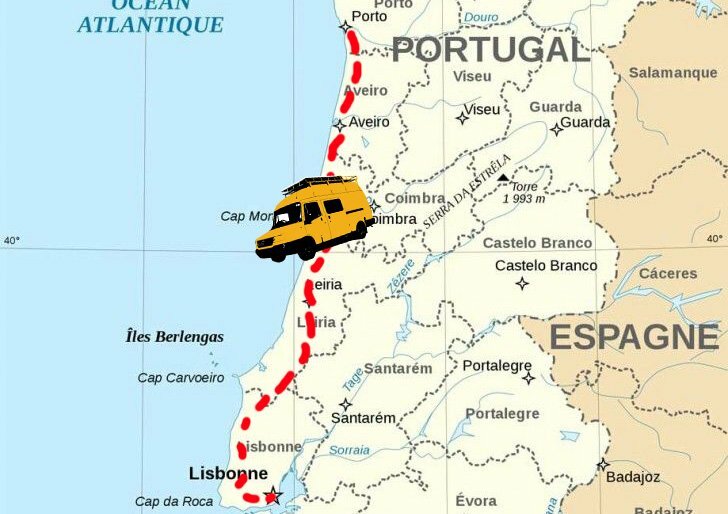 Chris had joined me in the van for the week and was getting a flight back from Lisbon Airport so we had a week to drive down from Porto. It was really nice to have some company although living with two people in the van took a bit of getting used to after two months on my own! After Porto we drove South to a quiet beach. I was very excited when I found some mussels on the rocks down by the water and as there were no gigantic chemical processing plants or obvious waste pipes into the water, I decided to take the risk and we FINALLY had Moule Mariniere! We enjoyed with wine on the beach, it was glorious. We were looking for the next place to stay and found a large abandoned building, while exploring we found a great place next to it overlooking a lagoon. We stayed there for the evening and walked around the building and took photos. We couldn’t work out what it used to be but it was great fun to explore. We found a high ledge and sat, with a beer, watching the sun set. We woke to a spectacular sunrise! The van was in a great position to get the morning sun which flowed in and warmed everything. I haven’t got a heater in the van at the moment so I’m very appreciative when this happens otherwise the van can stay a bit chilly all day. The next night we attempted to sleep in a forest by the beach but things didn’t quite go to plan…. As we drove into the woods the van wheels started slipping and sunk into the sand! We tried for three hours to get the van free but nothing worked so we admitted defeat and spent the night there. Sleeping at such an angle was not much fun! The next day we decided to try and find some help. Luckily we found a man with a van who, after some pleading gesturing, agreed to help pull us out. When we got back to the van there were five locals all gathered around pointing and laughing. I was really grateful for the laughter it definitely broke the tension and made everything seem a bit better. They helped push and finally we got free. Thank you kind locals, without you we would probably still be there! The next day we headed towards the beautiful area of Sintra and into another forest, this time not so sandy! Chris found a potential spot right at the top of a mountain so we aimed for this. The mist was slowly rolling in as we arrived giving everything a spooky, Silent Hill-esque atmosphere. I had managed to get food poisoning a few days previous and was still feeling pretty rough and didn’t fancy exploring too much so we did the obvious thing whilst camping in the woods and watched Stranger Things 2. Leaving the van that night was made infinitely more spooky because of this! The following day I dropped Chris at the airport and continued South. I was debating stopping in Lisbon for the night but I really didn’t fancy dealing with a big city and was craving somewhere a bit quieter.